I gave it a charitable 7/10. I’m being generous, though you might twist my arm to a 6.75. Initially, when I just finished it, I liked it. But the more I thought about it, the bruises started to show. My 8 went to a 7 in the last third of the film. I did like it that the film was not paced like an action/fantasy, but more like a genuine sci-fi. I will likely continue to second guess my thoughts about how smart or not smart it was, but here are my thoughts right now. I can understand people giving it a 6 or an 8, but anything higher or lower is too critical or too rewarding. There are problems on the most basic level of tension building and story-telling. First the good: some amazing scenes are in here, and this is better than many films I’ve seen this year. It is the best shot Sci-Fi ever. Also, you don’t have to know or like the original Alien to enjoy this. But the trailer was so good, and I’m not a fan boy, and I still say this didn’t deliver how it “said” it would. This movie was average at best, and the idiot writer from “LOST” the TV show should have never been hired to write this. It could have been legendary. It is forgettable. Beautifully rendered, but substantively illusive. The “LOST” screenwriter is not that smart, and delivered a faux-intellectual, psuedo-philosophical cheap gangbang. The logic was weak, the likability of characters hollow, and general satisfaction was lacking. Very little was answered, and you can’t just say “well, there moght be a sequel.” F*** that argument. Give me a single good movie before you rope me into a long string of ’em I have to commit to just to get to the “real” ending. There were plot holes you couldn’t ignore, and simply put: while a few loose ends are great for sci-fi, too many leaves the audience mad and leaves the film directionless. 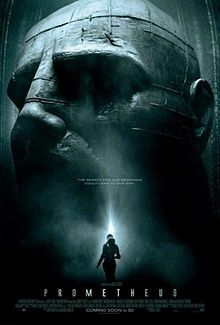 Thematically schizophrenic, “Prometheus” can honestly blame nearly all of its problems on the WRITING: direction, photography, special visual effects, costuming, make-up, and set design and acting where all great or better than great. The characters, motivations, and logic are all the writers fault. Ridley Scott, your biggest mistake was who you hired to write the screenplay. It is a movie that thinks it is brilliant while everyone watching knows it’s barely in its “Honors Classes.” It’s no genius. Did not deliever on medium to medium-high expectations. More a thriller than a horror, not that it mattered to me, but it might to you. Just give me a good sci-fi. Please.